Noted preacher and an excellent administrator. In Milan, Italy he established the congregations, the Society of Clerics of Saint Paul (the Barnabites) for men religious, and the Angelics of Saint Paul for un-cloistered nuns. Helped introduce the Forty Hours' Devotion. These groups helped reform the morals of the faithful, encouraged laymen to work together with the apostolate, and frequent reception of Communion. While on a peace mission, Anthony became ill and died at his mother's house; tradition says that in his last moments he had a vision of Saint Paul the Apostle. Born to wealthy pagan family, she converted to Christianity as a young woman during the period of the persecutions of Diocletian; she was baptized by bishop Saint Agatone. Febronia decided to devote herself to God which led to great harassment by the locals and opposition from her family, especially her father who planned an advantageous arranged marriage for her. To escape the abuse at home, she fled to live in the caves on Mons Iovis. Her father found her and was so angry at her defiance that she threw her into the sea. Martyr. Studied at Constantinople. Monk at Saint Michael's monastery, Kymina, Bithynia, taking the name Athanasius. Fearing that the was going to be chosen abbot, Athanasius fled to Karyes, changed his name, claimed to be illiterate, and hid in his cell. Hermit in a cave at Mount Athos, Greece in 958. Athananius helped his old friend from Constantinople, Nicephorus Phocas, prepare an expedition against the Saracens in 961, serving as almoner to the fleet. Phocas gave Athanasius part of the money raised, and the hermit used it to found a monastery on Athos in 963. This was to be an idiorhythmic house where anchorites, hermits, and monks could live in community, but without the requirements for group activity common to other monasteries. At the same time the monastery was being dedicated, his old friend Phocas became emperor. Fearing he would be called to serve at the imperial court, Athanasius fled to Cyprus. Phocas found him, assured the monk that he would be allowed to continue his religious life in peace, and helped finish work on the monastery. Though he faced opposition in the founding of this house, which ended only by imperial decree, the monastery flourished. Athanasius insisted on Bible study, founded a school and large library, and he personally planted hundreds of trees on the grounds. Eventually there were 58 communities on the mountain, and thousands of holy men still live there today. Pagan physician in service of Roman Emperor Valens. Sometime between 364 and 378, an angel appeared to Domèce and rebuked him for his abuse of Christians. He was led to a cave hermit on Mount Qouros in Armenia where he learned about Christianity, converted, was baptized, and stayed to live as a hermit for over 30 years. As a physician, he accepted all patients, including animals, healing many, including the healing of sciatica by prayer. Raised Protestant, he graduated from Brasenose College in Oxford, England in 1573. Taught at Saint Paul's School, London, England. Convert to Catholicism. 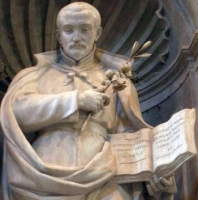 Began studies at Douai College, Rheims, France in 1581 Ordained a priest of the apostolic vicariate of England in September 1583. He returned to England in late 1584 to minister to covert Catholics during a period of official persecution. Martyred for the crime of priesthood. Married to a man named John from Edessa; she had previously made a private vow of virginity but received a revelation that she should agree to the arranged marriage. Mother of Saint Simeon Stylites the Younger. Widowed when Simeon was very young, she devoted herself to his Christian education. Visionary who received apparitions of Saint John the Baptist and of angels. Young layman of the apostolic vicariate of England. Educated of Exeter College, Oxford, England, and Douai College, Rheims, France. Arrested for "conveying intelligence" for a Catholic priest, he was imprisoned in the Tower of London and released on condition of banishment. He later returned, was arrested again, and martyred in the persecutions of Queen Elizabeth I. Married to Nicostratus, a high court official in imperial Rome. She had a great devotion to Saint Peter the Apostle. One day while praying at the tomb of Saint Peter, she was arrested for her faith. Martyr. Studied at the University of Oxford, England, and then the Douai College in Rheims, France. Priest of the apostolic vicariate of England, ordained in 1586. He then returned to England to minister to covert Catholics. Martyred in the persecutions of Queen Elizabeth I. Born to the French nobility. Franciscan at age ten. Priest. Bishop of Périgord, France in 1437. In 1452 he authored a report vindicating Saint Joan of Arc. Archbishop of Tours, France in 1468. Cardinal in 1483. Confessor to King Louis XI. Defended the rights of the Church against the power of the king. Member of the Missionary Oblates of Mary Immaculate. Priest. Missionary to Laos where he won the admiration of the locals by hard work and care for the sick. Martyr. Layman. Studied at the University of Oxford, England. Worked at the Catherine Wheel Inn, Saint Giles', Oxford for twelve years. Martyred in the persecutions of Queen Elizabeth I.
Lifelong layman in the diocese of Ferns, Ireland; worked as a sailor. Martyr. Lifelong layman in the diocese of Ferns, Ireland; worked as a baker. Martyr. Monk. Abbot of the Mother of God monastery in Terrti, a hilly district outside Reggio Calabria, Italy. Known for his personal piety, his adherence to this monastic rule, and his ascetic lifestyle. Son of a rich senator. Benedictine monk at Remiremont Abbey, at Treves (Trier, Germany) and at Luxeuil, France. Spiritual student of Saint Arnulf and Saint Waldebert. Bishop of Trier. Mother of Saint Tremorus. Widowed, she re-married, becoming the wife of Count Conmore of Brittany. After the martyrdom of Tremorus by the count, Triphina retired to a convent in Brittany. Convert to Christianity. Hermit at Nisibis, Mesopotamia. Martyred for challenging Julian the Apostate. Deacon in Jerusalem. Denounced the heretic Theodosius who had deposed Saint Juvenal as bishop of Jerusalem. Arrested, scourged and martyred for his support of orthodoxy and the decrees of the Council of Chalcedon. Married to Saint Grace of Cornwall. During renovation of the church named for them, a male and a female skull were found interred near the site of the altar, and are believed to be relics of the couple. Married to Saint Probus of Cornwall. During renovation of the church named for them, a male and a female skull were found interred near the site of the altar, and are believed to be relics of the couple. Married to Saint Gwen. Father of Saint Winwallus, Saint Jacut, and Saint Guithern. Forced to flee Britain in the 5th century when the imperial Roman troops pulled out, and life became hard and chancy as Anglo-Saxon pagans reclaimed their land. Travelled and help spread the faith in Brittany. Married to Saint Fragan. Mother of Saint Winwallus, Saint Jacut, and Saint Guithern. Forced to flee Britain in the 5th century when imperial Roman troops pulled out, and life became hard and chancy as pagans reclaimed their land. Travelled and help spread the faith in Brittany. First bishop of Reggio, Italy, ordained by Saint Paul the Apostle in the 1st century. Martyred in the persecutions of Nero. Princess who renounced her wealth and position to become a nun. Renowned for her sanctity and miracles. An elderly widow who was arrested, tortured and martyred in the persecutions of Diocletian for refusing to sacrifice to idols. Sixth century bishop of Nantes, France. Holy virgin who founded the church of Llanerfyl, Montgomeryshire, Wales. No reliable information has survived. 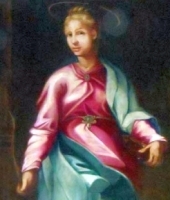 Virgin of San Severino, Italy. In writing and art she is often confused with the better known Philomena. Tortured and martyred in the Diocletian. Monk in 6th-century Ireland.Spiritual student of Saint Jagut.